Did you get to the Kent County Show at the Detling Showground this year? Three amazing days of cattle, sheep, horse shows and of course the floral arts marquee. Like any event there’s lots that goes on behind the scenes and I’d thought you’d enjoy hearing about it. 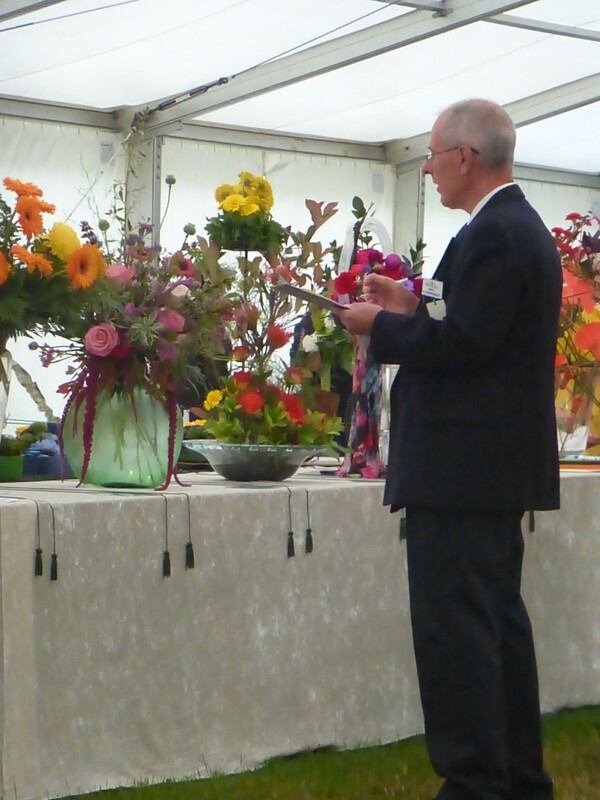 I play a small part on the Detling Show Committee – we meet throughout the year to agree the Show title, competition classes and general arrangements. My specific responsibility is as the Staging Steward. I draw up the initial show layout for the competition entries, making sure that there is space available for everyone. Inevitably there are glitches along the way, but this year my job was made so much easier by the fact we had a huge, brand new marquee. The Show days are Friday, Saturday and Sunday. 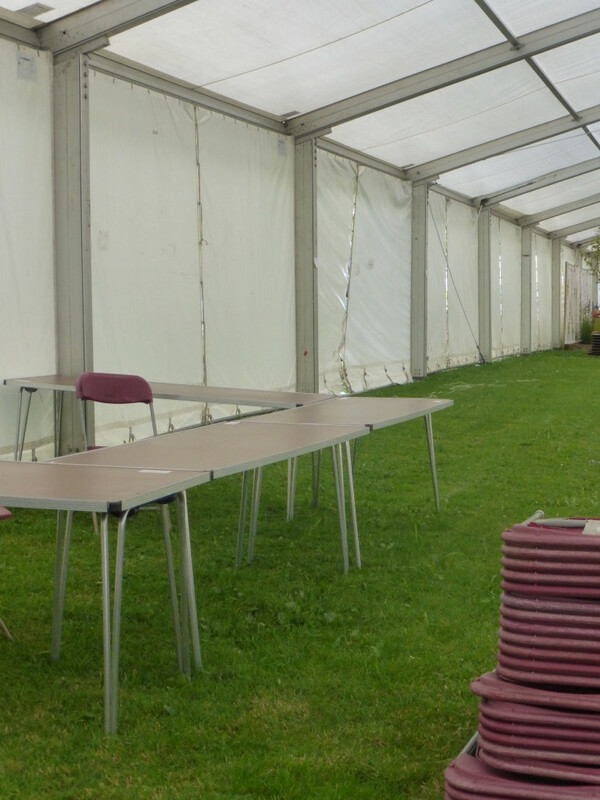 However, the Committee’s work at the Showground starts at 9am on the Wednesday morning. Together, with some extra pairs of hands we move the show benches into position. This is heavy and tiring work and by 11am we are only too pleased to be able to sit down for tea and cake, supplied by the Chairman and the bakers amongst us. The next job is to cover the tables with drapes/cloths. This sounds like an easy job, but there is always a scrabble to make sure there is sufficient length to the drapes to ensure that they fall to the grass on the front edge (did I say we were in a field?) and cover the exposed end sections of the tables. Strategic pinning is required to prevent slippage. After that’s done, the space allowed for each entry has to be measured out. Each space is defined with a decorative cord, which is pinned in place. After that “signposts” are knocked into the ground. This means that the class details can be pinned to the posts so that visitors can see an extract of the Show schedule and have a greater understanding of the competition. 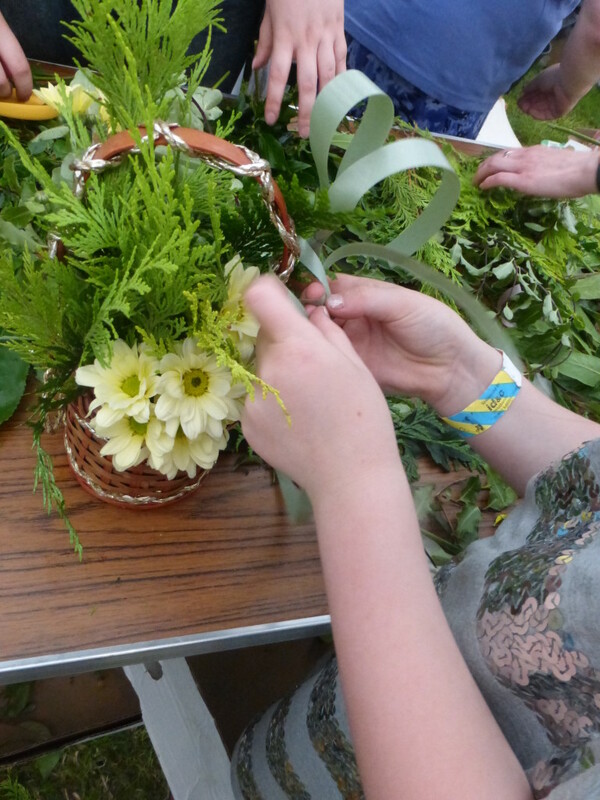 Flowers and foliage are then cut and conditioned for the six drop-in workshops that will take place throughout the Show, and for the imposed class – where all the materials are provided for the competitors, who then have to design and set up their entries under timed conditions. Name cards are placed at each exhibit point, to direct competitors to their allocated place on the day. 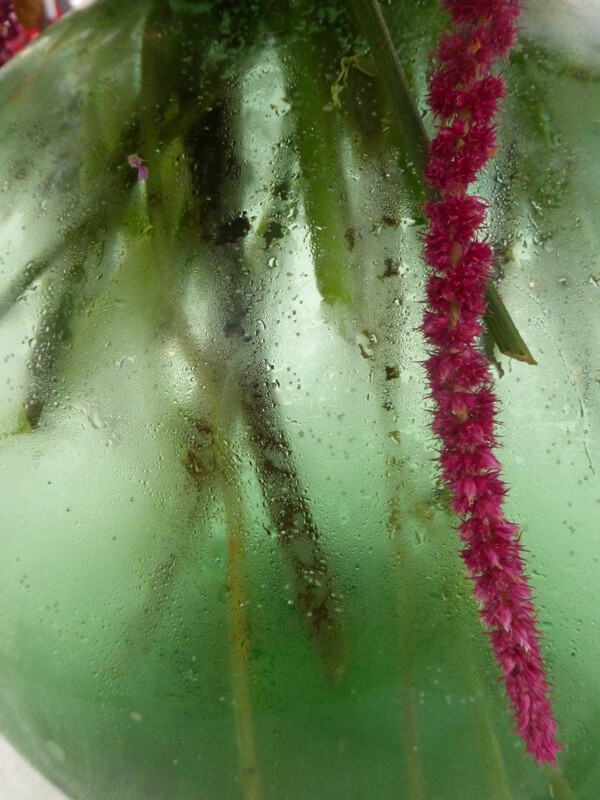 an extract of my exhibit – including condensation on the vase! Judging starts early on the Friday morning. 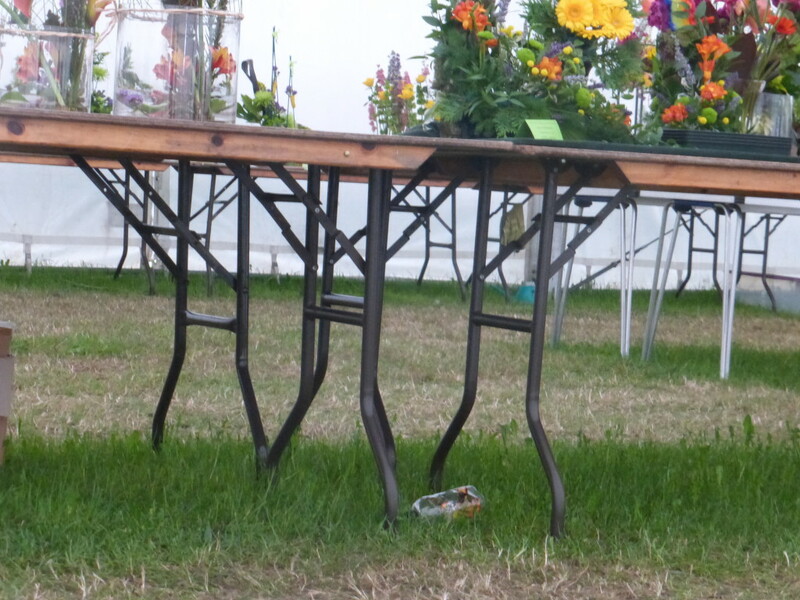 This is the serious business of the day, so only the two Judges, the Show Chairman, Secretary and Judges assistant are allowed in the marquee. The rest of the Committee and team of Stewarding volunteers arrive at 10am for shifts lasting until 6pm. I wasn’t placed in the class that I entered, although I do like to feel that I have matured as a competitor, not least because I agreed with the comments the Judges made – perhaps I’ll have better luck next year! After a tiring weekend, it’s all hands on deck to break down the Show and then join the long, slow-moving queue out of the car park before the journey home can begin.